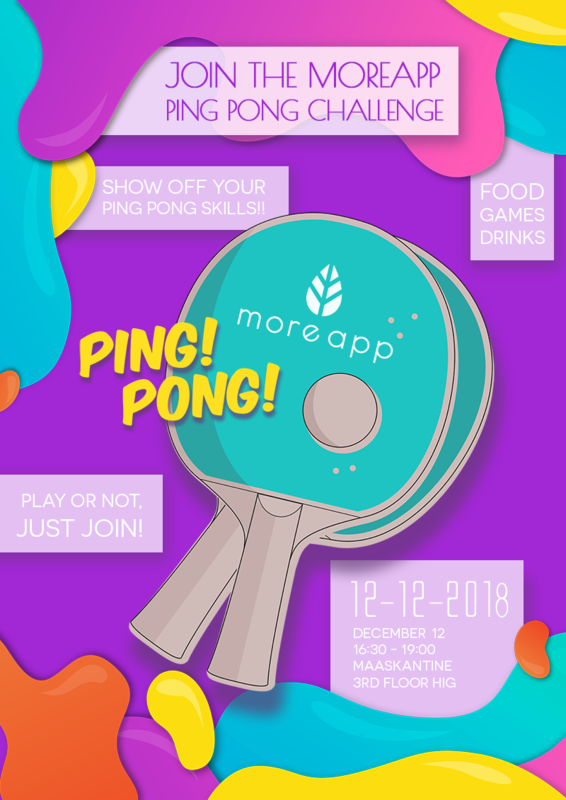 Come Take Part At MoreApp's Second Ping Pong Event! On Wednesday December 12th the second edition of MoreApp's Table Tennis Tournament will take place. Let's make it a success together! Organised by and for companies within Het Industriegebouw. Firstly, let's address the highlight of the event which is the ping pong challenge. During the ping pong challenge the games will take place in a round the table format with participants going against each other. There will be two tables arranged with winners from each table advancing to the grand finale, where the undisputed champion will be unveiled. Alongside this challenge there will be other activities during the event, e.g beer pong and mini basketball. Visitors can also look forward to food & refreshments during the event, there will be various snacks available, such as mini vegan burgers. Obviously not to forget there is beer, for all the beer lovers. For the non-alcoholic drinkers we also have soft drinks available. Music is something that brings people together. During the event we will be playing classic Dutch songs, participants also have the opportunity to request what songs they want to hear. Whether you play or not just join, everyone gets a surprise gift. You don't want to miss out! Sign up through this form. You can also let us know if you want to sponsor the event.